Conflict Management Coaching unites the fields of professional coaching and conflict management. It is a one-on-one process in which a trained coach assists people to effectively manage their interpersonal disputes and to gain increased competency in their conflict management skills. Conflict management coaching may be used in the workplace and a range of other contexts and there are also many applications of this process. We also provide documents and other tools to support a conflict management coaching practice. On completion, participants receive a Certificate of Attendance for 28 hours of the Conflict Management Coaching Workshop. Participants may receive up to 31 Continuing Coaching Education Units as approved by the International Coach Federation. For the 4 day in-person program the allocation is 26 Core Competencies and 5 Resource Development. For the 10 week virtual program or telecourse the allocation is 21.5 Core Competencies and 9.5 Resource Development. Mediator graduates of this workshop from Canada may apply the hours towards the educational component of the QMed and CMed designations (in accordance with the ADR Institute of Canada). This program has been approved by the Law Society of Upper Canada for 2 hours & 45 min of Professionalism Content and up to 25 hours & 45 min of Substantive Content. 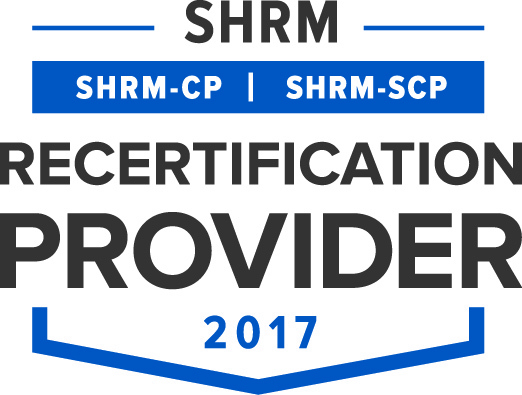 CINERGY® is recognized by SHRM to offer Professional Development Credits (PDCs) for the SHRM-CPSM or SHRM-SCPSM. This program is valid for up to 31 PDCs for the SHRM-CPSM or SHRM-SCPSM. For more information about certification or recertification, please visit www.shrmcertification.org. If graduates would like to become a CINERGY Certified Conflict Management Coach (Dispute Specific), we offer a Competency Assessment. This usually takes place up to 3 months after the workshop, once candidates have sufficiently practiced the model. The evaluation considers proficiencies that rate coaching skills and mastery of the model. Please contact us for more information. Graduates of the CINERGY Conflict Management Coaching Workshop are welcome to join the community of practice of CINERGY Coaches from around the world. They receive a monthly newsletter called CINERGEMS and may also participate in a monthly teletalk where we discuss a coaching topic or practice the model. Through self-reflection, skill-building exercises, discussion, simulations, demonstrations and skills practices, participants develop and practice conflict management coaching techniques and skills. The training will be of specific interest to coaches, mediators and other conflict management professionals, ombudsmen, HR professionals, lawyers/attorneys, leaders, social workers, psychologists, Union representatives and others who want to learn the fundamentals of a model for coaching conflict. NOTE: There are a limited number of spaces available in each workshop. Spaces are held on a first come first served basis, on receipt of payment. CINERGY Coaching will confirm by the registration deadline whether there are enough participants for the workshop to proceed. Workshops may fill up prior to the registration deadline. For any cancellations received after the registration deadline, there will be no refund, unless a replacement is found by the applicant. There are no refunds/partial refunds for days/partial days missed. Workshops may be coordinated in your workplaces and cities. Please let us know if you are interested. CINERGY Coaching's Conflict Coaching workshop combines remarkable insights into both coaching and conflict management. It also provides participants with numerous opportunities to practice the coaching skills they need to help clients deal with conflict more effectively. Her approach to using powerful questions in conflict coaching is masterful! Craig Runde, Director, Center for Conflict Dynamics, Eckerd College and co-author of "Becoming a Conflict Competent Leader" and "Building Conflict Competent Teams"
CINERGY conflict coaching training provided me with excellent tools with which to pursue my own coaching practice. I found her workshop very thorough and the practical exercises provided great insight into how powerful the conflict coaching process can be. I found Cinnie’s knowledge, coaching and training approach inspiring and would recommend her workshops to all practitioners involved in conflict resolution. The CINERGY Conflict Coaching training supported my professional growth as a practitioner by giving me a quality, well-thought out and researched coaching model. This structured process produces realistic results for clients empowering them to embrace conflict in constructive and productive ways. The CINERGY Conflict Coaching training was comprehensive, cohesive and efficient. The trainers honoured the principles of adult learning and sustained an inclusive, supportive and respectful learning environment – complemented with just the right amount of fun. I now have a dynamic model that enables a formal, coherent approach to working with conflict constructively. Thank you. I cannot thank you enough for the fantastic model you've created and shared. Since completing this course I have had profound professional and personal development and insight. The success achieved in dealing with workplace matters in this structured and competent manner has been astounding. As employers move from a punitive approach to a restorative approach - conflict management coaching is a necessary tool for union representatives to assist their members in managing interpersonal conflicts. Conflict management coaching is something most representatives are already doing – this training helps with that process by giving you an excellent format to follow.